Undergraduate student Mikaela Raeder first became interested in Optically Stimulated Luminescence (OSL) dating during her Fall 2016 Geomorphology course, instructed by Dr. Joel Spencer. During this course, she had the opportunity to carry out a small-scale project on the dating of quartz crystals collected from the exposed fluvial terraces along Kings Creek on Konza Prairie Biological Station (Figure 1). This experience sparked her interest in undergraduate research and her current project on phytoliths. Figure 1. Undergraduate student Mikaela Raeder collecting core sample in Konza Prairie. Phytoliths, also referred to as bio-opal, are produced when monosilicic acid from soil absorbed through roots of plants and is chemically altered to form silica, producing an intra or extracellular microscopic particle. These silica particles often take and maintain the shape of surrounding cells, acting as molds of the original plant material. Highly resistant to degradation, these silica structures are preserved in the soil or sediment even after decomposition of the organic material. From quartz and feldspar analysis, we know that upon burial, silicate minerals begin to absorb natural ionizing radiation, causing luminescence signals to accumulate within the mineral structure. Assuming that the time between death of the grasses and burial is insignificant, and that the sediment remains undisturbed, we should be able to achieve an age of formation for the phytoliths. If these phytoliths are re-exposed to surficial conditions through weathering and erosion, luminescence signals may be reset or altered due to daylight exposure, and upon re-burial a signal begins to accumulate once again. These properties provide a radiation history and in turn an age for sediment deposits. Furthermore, luminescence signals can be reset by heat due to thermal exposure, allowing for the use of silicate minerals as paleothermometers. 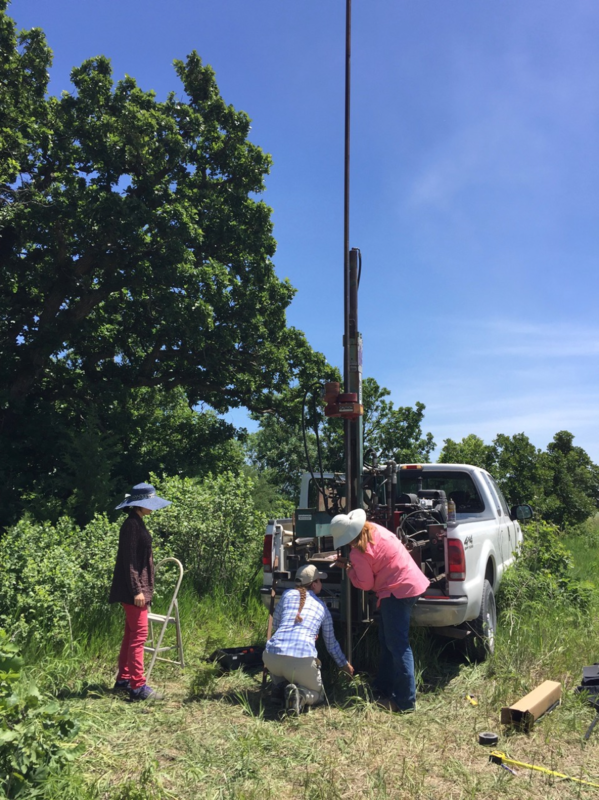 The first stretch of this study, funded by the College of Arts & Science Undergraduate Research Award, aimed to examine the use of phytoliths from tall grasses and soils of Konza Prairie Biological Station (KS) in luminescence data analysis. While traditional luminescence studies are conducted with the use of silicate minerals derived from clastic weathering and sedimentary processes, this study intended to determine if phytoliths can be used for luminescence research, based on their ability to store radiation dose and thermometric information within their mineral structure. Mineral preparation techniques and OSL measurement methods were optimized for phytolith samples. In addition, natural burial doses were measured; however, these values showed significant discrepancy compared to our quartz OSL data. Preliminary OSL results are very encouraging but have also generated a number of further research questions. Current research funded by the Office of Undergraduate Research and Creative Inquiry will investigate: (1) with scanning electron microscope and x-ray fluorescence (XRF) analyses whether the <2.37 g/cm3 density fraction used in mineral preparation correctly isolates phytoliths; (2) OSL signal thermal stability and fading characteristics to address discrepancy between quartz and phytolith results; and (3) possible etching of alpha-particle luminescence with HCl acid that may simplify dating calculations. Ultimately, this research may provide an exceptional alternative to quartz and feldspar analysis. In addition, development of phytolith OSL may further contribute to developing an understanding of the evolution of tall grass prairie ecosystems.